Every year at this time there are lots of questions about how to get rid of dandelions and lots of concern about honeybees needing dandelions to survive. Most of the argument is based on emotion on both sides. Proud lawn owners want a nice smooth carpet of lawn. Beekeepers and nature-lovers want plenty of food for the bees and other creatures. The truth, like most things, is somewhere in between. So let’s look at the issues and see what we need to know to make good decisions. 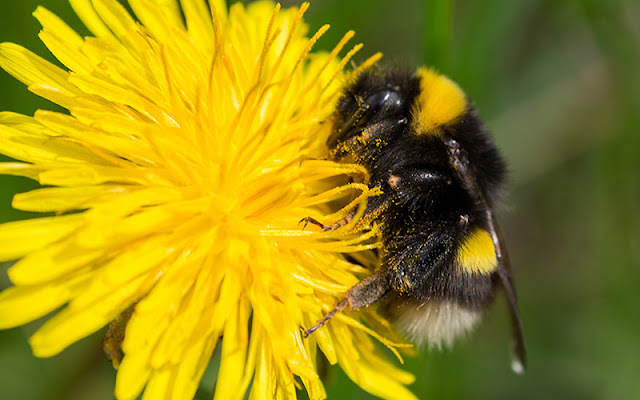 Dandelions: Bee Feed or Pesky Weed? Common dandelion, Taraxacum officinale, is both native and introduced in the US depending on the subspecies, making dandelions a natural part of many environments in the wilds around us. Honeybees are imports from Europe, Africa, and Asia. At least the European bees would have been familiar with dandelions from thousands of years of interaction. Any sunny spring day in a meadow filled with dandelions will tell you that the bees use them, but a closer look will tell you a lot more. The first thing that I have noticed is that the bees seem to prefer visiting apple and maple trees over the dandelions even though the main bloom time is the same. A little further research on Google Scholar will show that the total protein content for apple and maple pollen is above 20%, indicating they have enough amino acids that the bees could feed off their pollen alone without becoming deficient in amino acids or protein in general. Dandelions didn’t have as much information from studies listed on Google Scholar, but what was regularly covered was telling. When dandelion pollen was feed to solitary bees (not honeybees, mind you) larval development was stunted or incomplete. Studies indicated that dandelion pollen was short in essential amino acids (although exact details were not given). I could not find a single study that indicated anything other than dandelions do not have a very good protein and amino acid content. Just because dandelions are not the best protein sources for honeybees does not mean they are not valuable. Most experts feel that honeybees do better when they gather pollen from different sources, much like humans do better when we eat a wide variety of foods. And while we have a pretty good notion of what bees need as far as amino acids and protein go, we don’t know much else of what their nutritional needs are. So in the end it really depends on your situation. If you are in an area that provides a lot of diverse forages for your bees, they will likely not miss the dandelions. If you are in an area where food is scarce or where there is not a good variety of species, you would be best to keep the dandelions around. This is especially true if you do not have maples or apples and other high protein fruit trees around. If you are really worried about honeybees and native bees, the best approach is to find ways to provide them with an abundant and varied diet. This planting would also include flowers for different times of the growing season from different plant families. That way the local bees will not have to rely on any one type of flower, and you will have a great color display all season long.